Snake Wrangling……been there, done that !!! Today most love to be part of a virtual club called “I’ve been there and done that” and one of the activities that tops the list is ‘snake wrangling’! Thanks to umpteen programs on television channels that have promoted awareness and increased tolerance for reptiles, but have also induced people to blindly try what herp experts after years of training do on screen. Then there are others who rescue snakes ill equipped in terms of knowledge, equipments or protection. Some who have mastered the skill lack basic knowledge about snakes in general, but can be trained to do the job right. There are some who possess theoretical knowledge about snakes and want to study them but need training in handling them. Some are genuinely keen to expand their knowledge about reptiles. Then there is the “I know it all” group, who are beyond fixable. Many snake rescuers keep rescued snakes under unhygienic conditions for days. Reasons may vary from showing it to friends and relatives or out of excessive ‘love’ for the snake. Though this is illegal not many are aware or they just ignore. Majority of them are ill equipped and with increasing numbers each rescuer also seem to have a territory which when crossed could prove a problem, ultimately ignoring the very cause i.e. the welfare of snakes. As a keen reptile enthusiast I recognize this trend and believe that now is the time to educate and empower people on right and ethical methods of handling snakes or any other reptile. 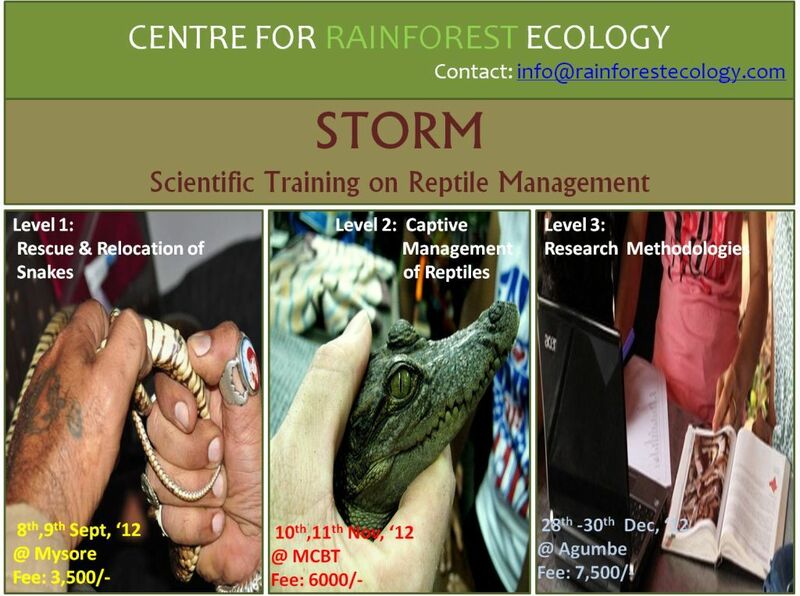 Hence we conceived a three series program called, STORM- Scientific training on Reptile Management which starts with basics on reptiles, right and ethical rescue methods, captive management, and field techniques to study reptiles. The first workshop takes place at Mysore in collaboration with ‘Snake Shyam’, who has rescued over 22,000 snakes in and around Mysore! We work together to share our knowledge about the importance and methods of identifying snakes, measures to be taken before a rescue, using right equipments in the right way, first aid for snake bites, Do’s and Don’ts of snake rescue, information to collect before reaching the rescue location, legal issues with snake rescue, methods of recording data, creating awareness at the rescue site, and identifying relocation sites. The main highlight is the opportunity for participants to accompany us on live rescue calls where all the above topics are shown practically and participants learn by watching us at work. The second workshop takes place in Centre for Herpetology, Madras Crocodile Bank Trust (MCBT), a gene pool for crocodiles. It is an ideal place to explore the world of reptiles and understand the big picture of captive management. Participants learn about unique designs of different crocodile pens made to suit habits of each species and assist in their maintenance. They get to help researchers in ongoing research by capturing crocodiles in their pens, measuring, and recording data. Understanding dietary requirements by feeding snakes, crocs, turtles and tortoises is a rare opportunity to get close to these reptiles. A visit to the venom extraction centre managed by the Irula tribe and a walk with these expert snake locators presents a different perspective to learning methods of locating snakes in the wild and appreciates the way the Irula co-operative society has given a reason for snakes and humans to co-habit these arid landscapes. The third workshop focuses on sharing scientific methods of studying snakes in the wild. 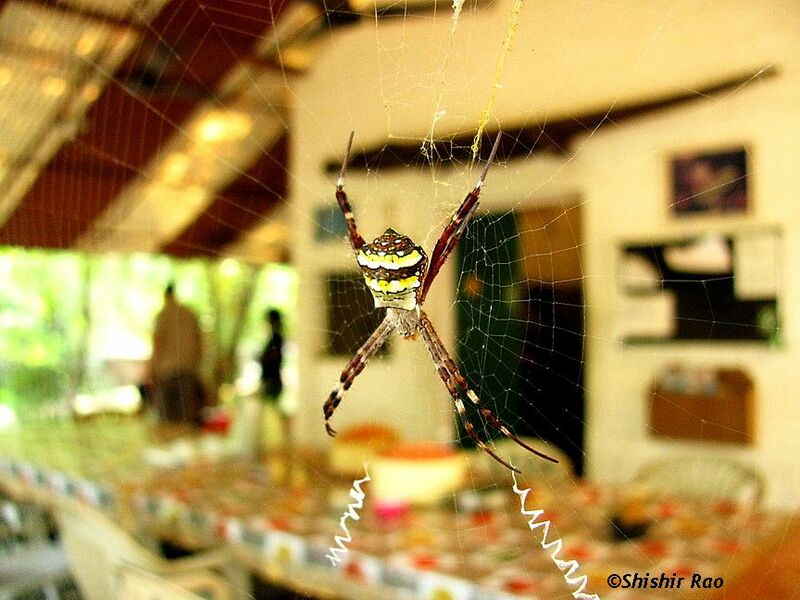 This takes place at the Centre for Rainforest Ecology in Agumbe. Part of the Western Ghats and home to the King Cobra, Agumbe offers every reptile enthusiast a platform to explore the world of snakes and other reptiles. With over 225 (i.e. 12%) endemic reptiles one gets an opportunity to appreciate this niche eco system rich in herpetofauna. Starting with a basic introduction to snakes found in this region participants then learn different sampling techniques, methods of surveys and data collection Photo-taxonomy is another important topic that is ignored by many but has good potential if used right. At the end of the series each participant will be in a position to identify the snake they are going to rescue and use appropriate methods, will consciously rescue snakes with minimal stress, will be in a position to explain to public about reptile conservation, read and understand herpetological studies underway, may be inspired to pursue further studies themselves and above all become eco-custodians of these misunderstood creatures. 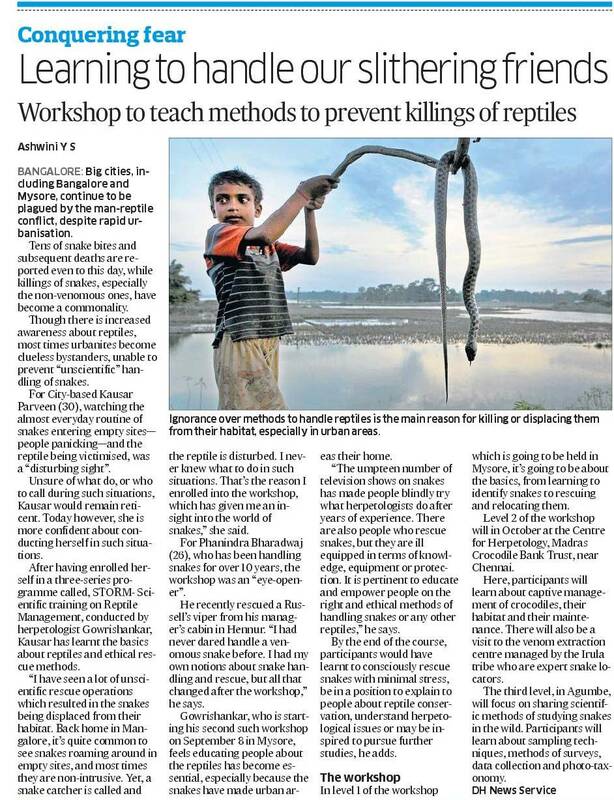 Check out an article about our workshop- STORM (Scientific Training on Reptile Management) in Deccan Herald today. Radio telemetry as a tool used for wildlife research has proven to be very effective in understanding the secretive lives of the animals being studied. The first ever radio telemetry study on snakes in India was initiated in 2008 at the Agumbe Rainforest Research Station, Agumbe, Karnataka. 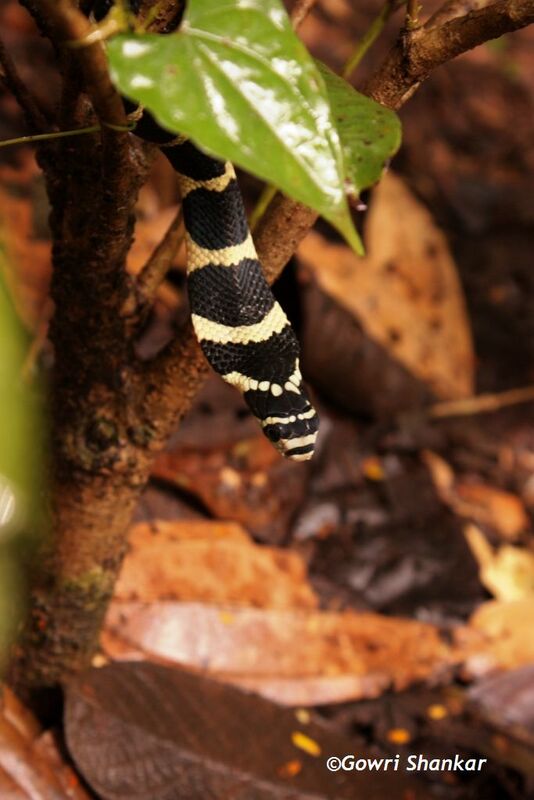 King Cobras (Ophiophagus hannah) were surgically implanted with radio transmitters and released back into wild. 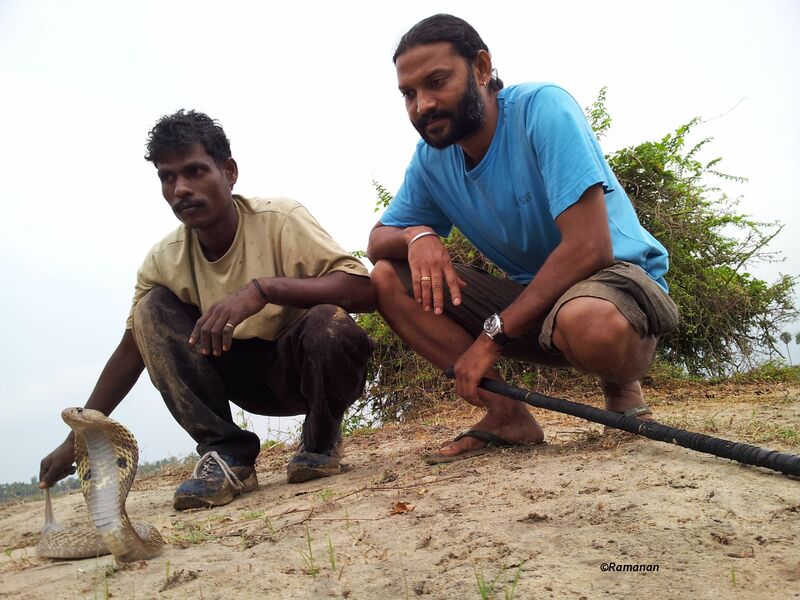 A team of research associates, volunteers along with field trackers followed the snake every day and recorded data. Training and working under the guidance of Rom and Matt was a great learning experience for me. Every stage of the project brought with it its own set of challenges and rewards. From working with the forest department for permits, assessing rescued king cobras fit for this study, assisting the team with the surgery, organizing field trackers, identifying and training volunteers, managing local support and press, supervising and assisting the team on field to ensure each day goes smooth was quite a handful; But listening to the day’s findings every evening was worth it! This work was recently published by the Environmental Information System Centre in their ENVIS BULLETIN Wildlife and Protected Areas as part of their issue focusing on ‘TELEMETRY IN WILDLIFE SCIENCE’. The complete issue can be accessed at: http://www2.wii.gov.in/envis/telemetry/index.html. Below is the abstract from our paper. Over the past five decades, radiotelemetry has become an increasingly important tool in wildlife field research, providing researchers with the ability to follow individual animals as they live out their often secretive lives. Radiotelemetry studies of snakes have enabled researchers to determine an impressive array of important ecological parameters, including home range characteristics, the fate of translocated animals, location of den sites, and documentation of behaviours in the field that would otherwise be extremely difficult to observe. Here, we present data from the first-ever field study of King Cobras (Ophiophagus hannah, Cantor, 1836) in their natural habitat in the rainforests of Agumbe in Karnataka, South India. 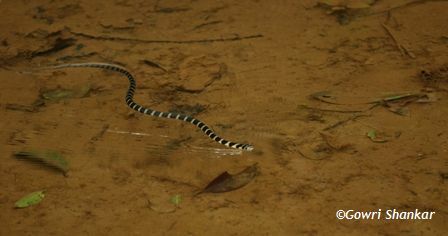 Although we have obtained critical data on King Cobra spatial ecology that will ultimately lead to recommendations on how to better conserve these charismatic serpents, of equal or greater interest is documentation of a wealth of King Cobra behaviours that have never been observed in the wild. We discuss radiotelemetry and summarize yet-to-be published results of this pioneering study of the world’s largest venomous snake. We also discuss our efforts to use our data to develop educational programs aimed at local communities, and our ultimate goal of establishing the first-ever sanctuary with a snake as the flagship species. The complete paper is downloadable and may be used for non-commercial purposes with due acknowledgement. 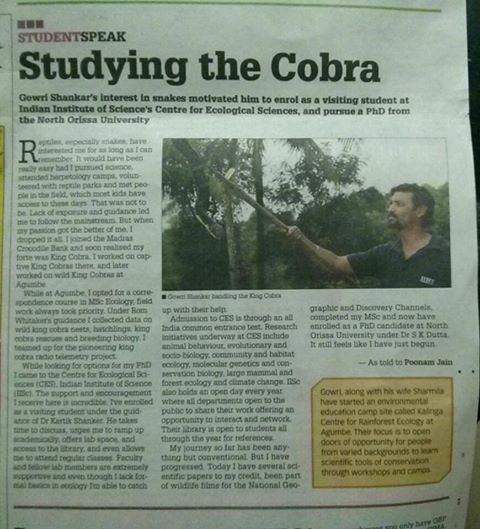 DOWNLOAD: Application of Radiotelemetry Techniques in Snake Research: King Cobra . When knowledge is made progressive it opens up avenues for growth. This is exactly what I wanted for participants of my workshops so that their learning does not stagnate. Participants from the rescue and relocation workshop (conducted at Mysore in Jan and March 2012) joined me to the Centre for Herpetology, Madras Crocodile Bank Trust (MCBT) on the 12th and 13th May. The idea was to help them explore the world of reptiles, understand the bigger picture of captive management and appreciate skills of the Irulas. Though May is not the best of times to hit the east coast, the enthusiasm of our participants shamed the sweltering sun! Gayathri Selvaraj, education officer at MCBT took the group on an interactive tour where she spoke about the eighteen different species of crocodiles housed here and patiently answered all queries. 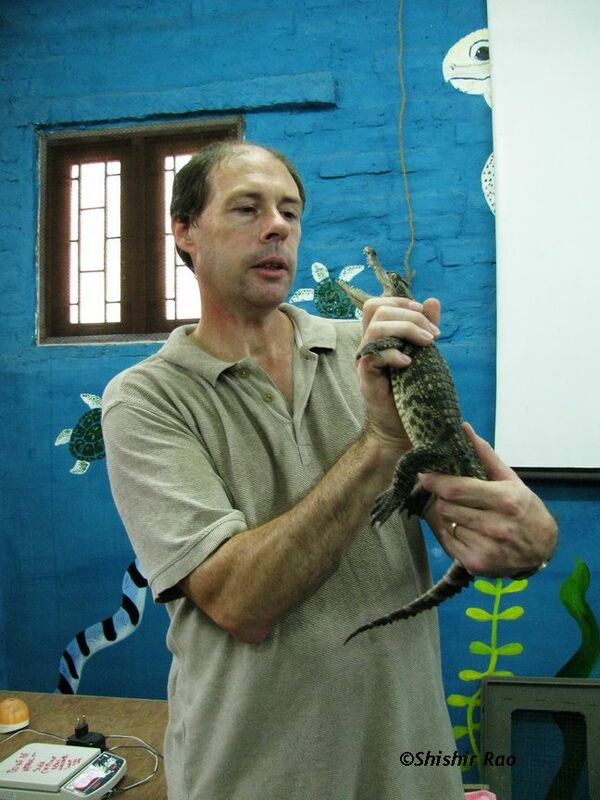 Things got very exciting when the director of MCBT, Collin a herpetologist himself spoke about ‘Crocodile biology’. His presentation skill with a great sense of humour was much appreciated by the participants. With over 30 years of experience in housing crocodiles and snakes, MCBT is ‘THE’ place in India to study and understand captive management of reptiles. We observed the unique designs of different crocodile pens made to suit habits of each species. It was interesting to note the provisions made for basking, nesting, clean water, right kind of plants, and shade to rest. Being cold blooded, crocodiles need to regulate their body temperature and unless the right temperature and humidity is made available their survival is impacted. 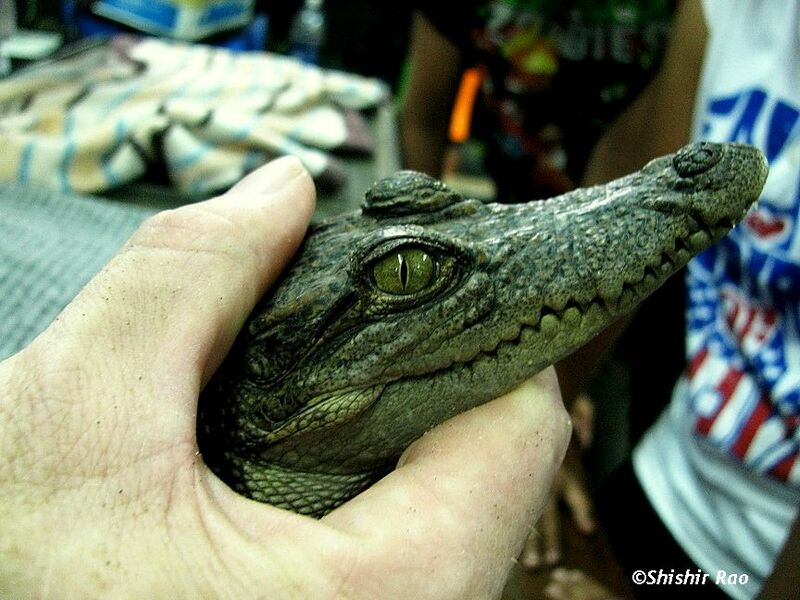 Madras Crocodile bank serves as a gene pool for crocodiles. Hence captive breeding is an ongoing activity. Dr. Gowri Mallapur , Asst. 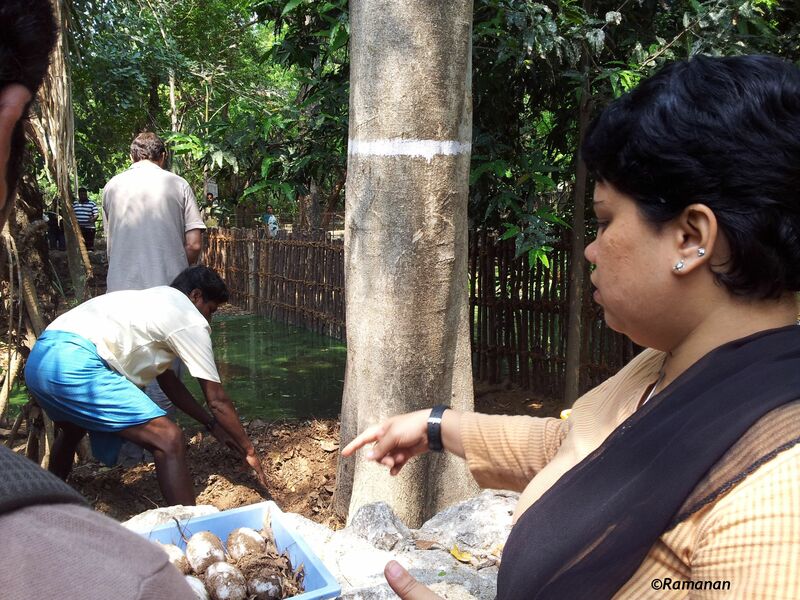 Director, explained the importance of regulating and checking the growth of hatchlings at fixed intervals. Participants got a chance to weigh, measure the total length and snout vent length of Siamese crocodile (Crocodylus siamensis) hatchlings. This data was then meticulously recorded to be stored in their database. 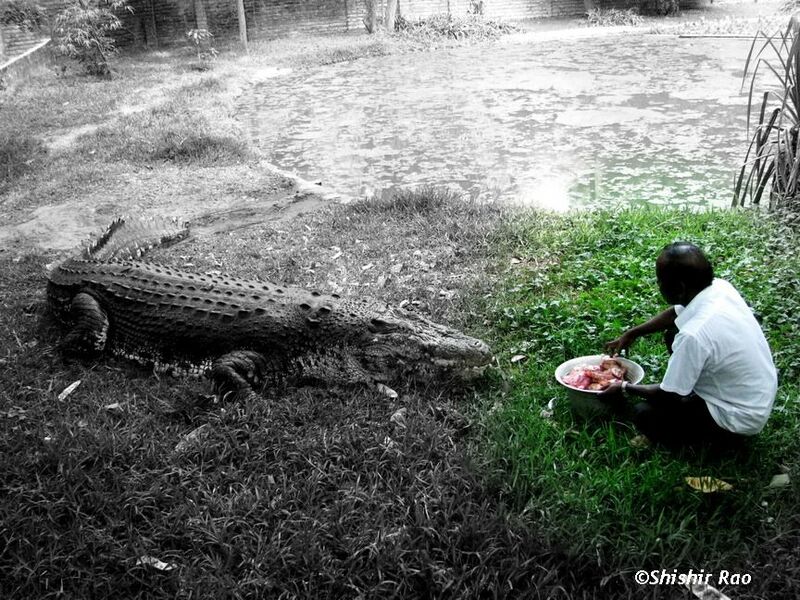 Crocodiles in the wild are opportunistic feeders. They usually feed once every 7- 10 days (depending on the size of their previous feed) and are known to last for days without food. A 15 ft crocodile can go without food for almost a year! At Croc bank they are fed twice a week with beef and fish. Participants watched Jaws III, the largest captive salt water crocodile (Crocodylus porosus) in Asia feed on chunks of meat. Participants then watched the reticulated python (Python reticulatus) feed on rats. These snakes are the longest snakes in the world (growing up to 11 meters) and in the wild their major diet comprise of birds and small mammals. Their bulky bodies give an impression of being sluggish but it is during feeding that one can actually observe their agility and speed. Quickly grabbing their prey, coiling around it and then slowly swallowing the meal is a true exhibit of their wild feeding instincts. It was now time for everyone to get their hands dirty and to get to the task of cleaning mugger pens. This activity not only helped in understanding the aesthetics of managing a pen but also created a sense of appreciation for the work that MCBT has been doing for years. The night safari at the croc bank is as good as star gazing! It is a sparkling wonder when over 300 eyes glint under torch light. Eye shines serve as the best cues while surveying and capturing crocodiles in the wild. Apart from eye shines participants also spotted a rat snake and a vine snake within the campus. After a high dose of crocodile gyan it was now the turn of snakes. Being snake enthusiasts everyone woke up excitedly at 5 in the morning and joined the Irula tribe on a snake walk. The Irulas were local hunters and gatherers. Traditionally they hunted mongoose, monitor lizards, birds, paddy rats and snakes. The tribe’s skill in locating snakes and monitor lizards were exploited by skin industries till late 70s. After the ban by Government on wildlife products, their activities were considered illegal. They however continued to smoke rats from burrows as rats form a major part of their diet. That’s the time Romulus and Zai Whitaker setup the Irula snake cooperative society to extract venom from the big four of India. [Common cobra(Naja naja), Russell’s Viper(Daboia russelii), Saw scaled viper(Echis carinatus), Krait (Bungarus caeruleus)] for anti venom production. Along with Kali, an Irula, we walked through paddy fields, villages, and scrub jungles. And during our three hour walk we found seven snakes. Two bronze back tree snakes(Dendrelaphis tristis), one green vine snake (Ahaetulla nasuta), two Indian rat snakes (Ptyas mucosa), a common cobra(Naja naja) and a striped keel back (Amphiesma stolatum). The best part was the accuracy in spotting them. Participants noted down the macro and micro habitats, the scientific names of the snakes found, the location they were spotted at, and signs used to locate these snakes in their data sheets. It was time for unwinding at the beach and then for reflection. What started as just basic learning about snakes, scale counts, and snake rescue now progressed into a deeper understanding of the reptilian world. This awareness I hope will create a deeper passion, a thirst for knowledge and hence a greater commitment from these enthusiasts for conservation. Our next journey is into the deep jungles of the rainforests in Agumbe where we will brave the monsoons and herp through challenging terrains to find herps in their habitat. Come July (6th to 8th) we all meet again. Until then adios team! PS: For more info about camps please check the Upcoming workshops & camps page. Wishing all readers a happy new year! I sincerely apologize to all who follow this blog for a late update. 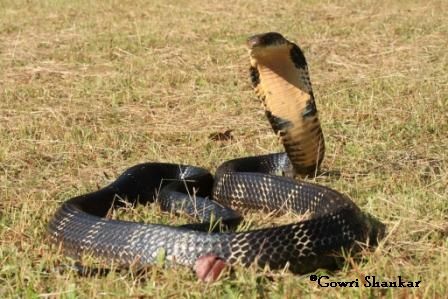 I hope the excitement will come alive as you read about king cobra hatchings of 2011. A King cobra nest is nothing short of a wonder. King cobras build their nests using dead leaves which they pack so tight to stand tough against the heavy downpours that lash for months. Our studies in the Western Ghats reveal that hatching happens between July end and mid-august. The average incubation period varies between 100 to 113 days and once the hatchings emerge they remain close to the nest surviving on the remnants of the yolk. There is no parental care and after 3-4 days they shed (molt) and disperse to fend for themselves. Hence these baby king cobras possess enough venom to start hunting from day one. Though they can hood up and deliver fatal bites many fall prey to a variety of predators and it is approximated that only one or two reach adult hood. 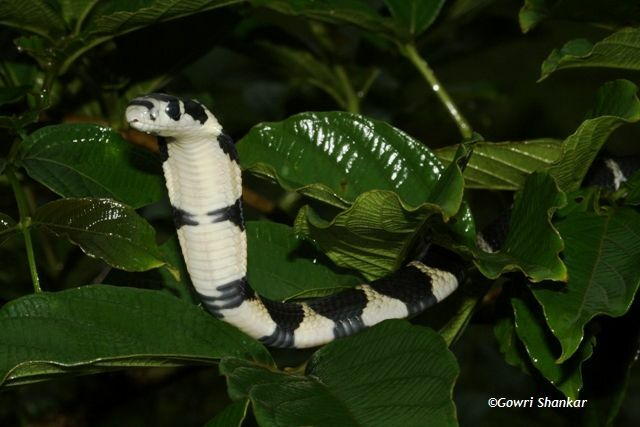 In 2011 we received reports of six king cobra nests in Agumbe and four nests in Mizoram. 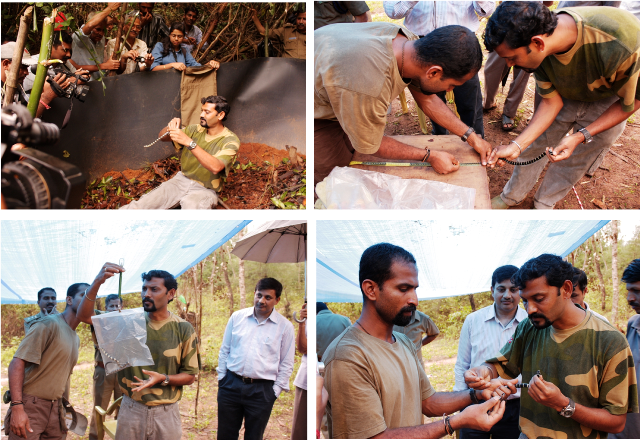 In Agumbe, the inherent reverence among people and our efforts in the past to build trust and confidence has made people more receptive, accommodative and tolerant towards king cobra nests. And now that there is a team at ARRS trained to monitor nests and collect data, this year I decided to concentrate on nests at Mizoram. 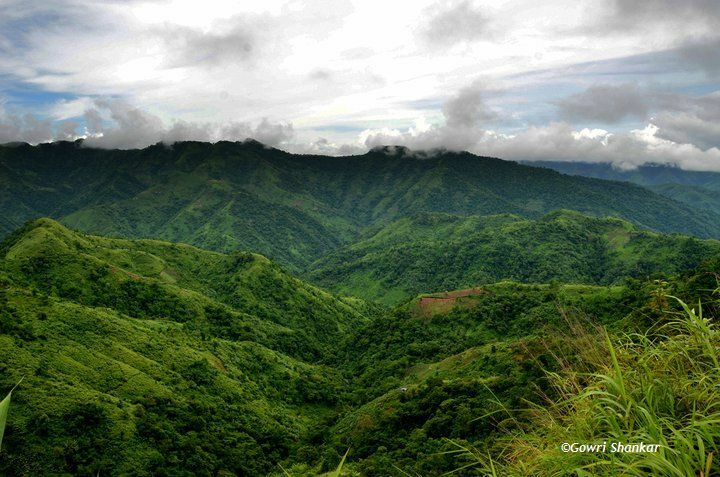 As soon as we heard about nests in Mizoram I was off to check them out and gather data. I have always admired Rom’s style of ‘throwing the hat of the fence’ and then decide how to collect it. Irrespective of lack of funds, resources, resource people, logistics, we started off with nest monitoring at Mizoram. And yes things slowly fell in place! Big thanks to funds donated by Late. Luke Yeomans of the King Cobra Sanctuary, Nottingham and ARRS. I reached Mizoram in the first week of July and with help from HT, Hrima, and Siama (folks at Mizoram involved and interested in herps especially king cobras) we set forth on the first leg of this project. Siama, an MSc graduate from Mizoram University joined us as a research associate to help in data collection. We first visited Sailum. 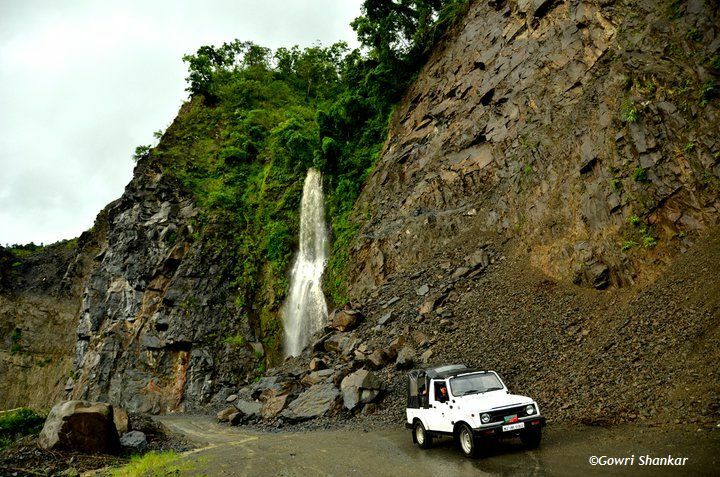 These hilly regions with steep terrains are quite a challenge. We had to trek on slippery slopes cutting through thorny bamboo under continuous drizzle for over two hours to reach the nest that was hardly 1/2km from the village. However the arduous climb was worth it as we saw the female king cobra on the nest. We noted down the temperature, humidity, nest height and width, took down GPS readings and left immediately. 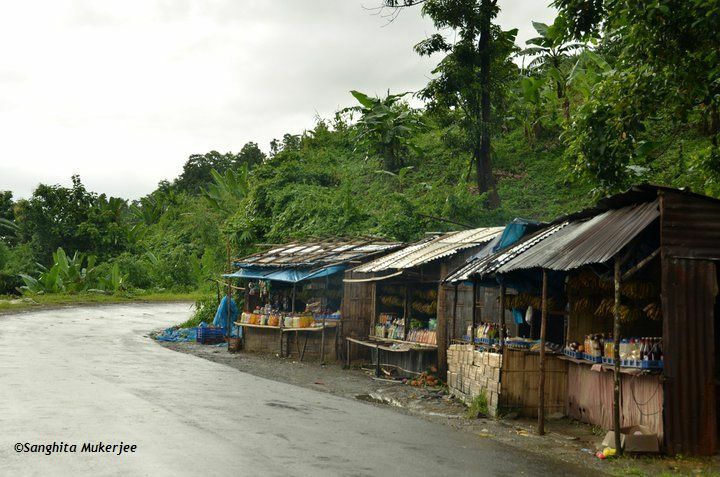 The following day we visited Phunchawng, a village 15km from Aizawl. We then visited Saitual another village and with David’s (school teacher) help located the third nest. However, we could not visit the fourth nest as it was not accessible due to heavy rains. These nests were spotted by people who ventured deep inside the forest to collect Bamboo shoots, a staple diet. 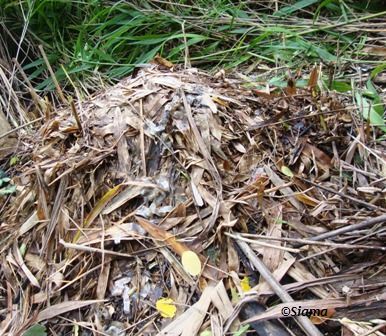 All these nests were built on slopes (~45 degrees), within bamboo thickets and using Bamboo leaves (Dendrocalamus longispathus). Apparently during the nesting season HT and Hrima receive at least 10 rescue calls to remove females on nests in and around Aizawl. It was very disturbing to learn that some people use this as an opportunity to hunt these snakes (more like an organized sport) too! Female king cobras in Mizoram are known to guard their nests for longer periods almost till the hatchings emerge and even after interference/disturbance by humans they return and continue guarding them. But! in Agumbe of the 16 nests that we have monitored, females usually leave the nest after 2-3 weeks (of laying eggs) and never return ; esp. if there has been any human disturbance. The maximum number of days that I have seen the female on the nest in Agumbe is 32 days. At Mizoram the females on these nests were present till the 26th of July, 30th of July, and the 24th of August respectively. The hatching took place 2-4 days after the females left. Out of a total of 60 eggs, 57 hatchings were recorded from these three nests. Back at Agumbe, Prashant, Base Supervisor who has assisted me for years in monitoring king cobra nests helped our new research associate, Ajay Giri in monitoring six nests this year. Out of a total of 144 eggs, 97 hatched. It is indeed a long tough road for these young kings. How many make it to adult hood, what are their food preferences, what strategies they adopt to survive, how often they shed (molt), what resting places they prefer etc., still remains to be answered. Another avenue yet to be explored and studied!